Originally, the business district of Crawford was located at what is now the edge of Crawford to the west about one mile from the present location of the stores, filling stations etc. The "old town" burned (17 August 1883, see below for more information) after which it was rebuilt in the present location west of the GM&O Railroad. The "right-of-way" of the railroad was deeded by John W. Carr - Grandfather of Mrs. Bailey Carr Scales who now lives in Starkville, Mississippi. 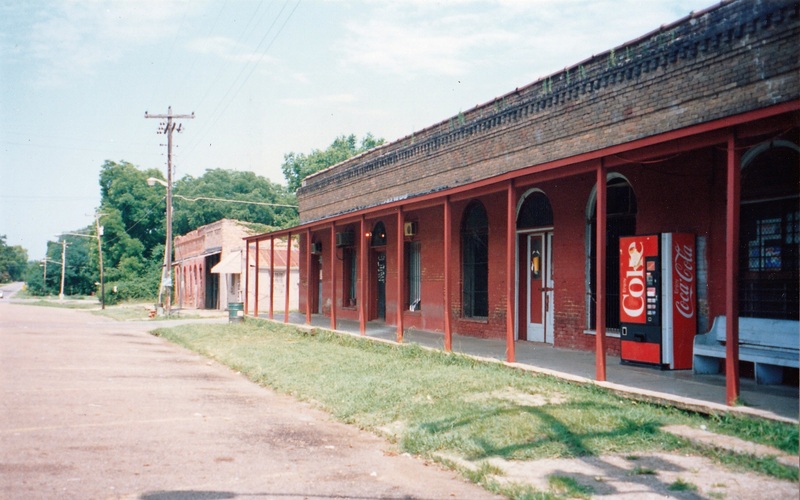 The brick store buildings, with the exception of the liquor store, are the original buildings. 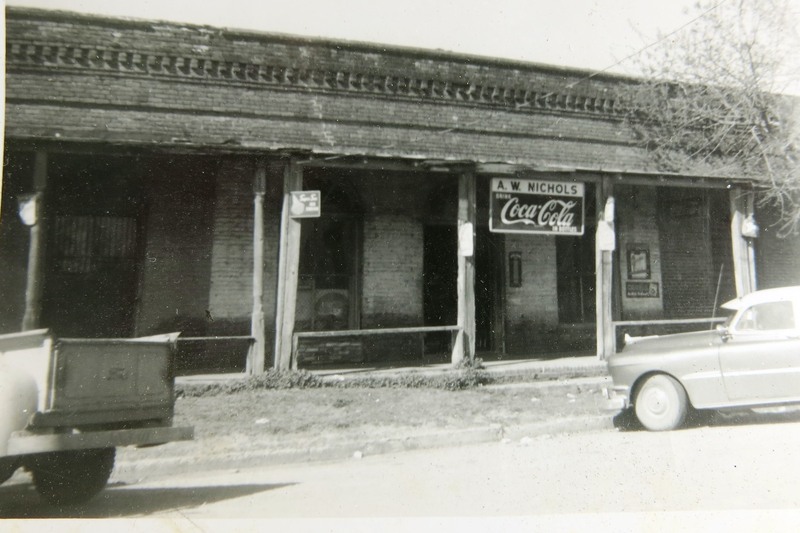 The liquor store building was the first and only Bank in Crawford. 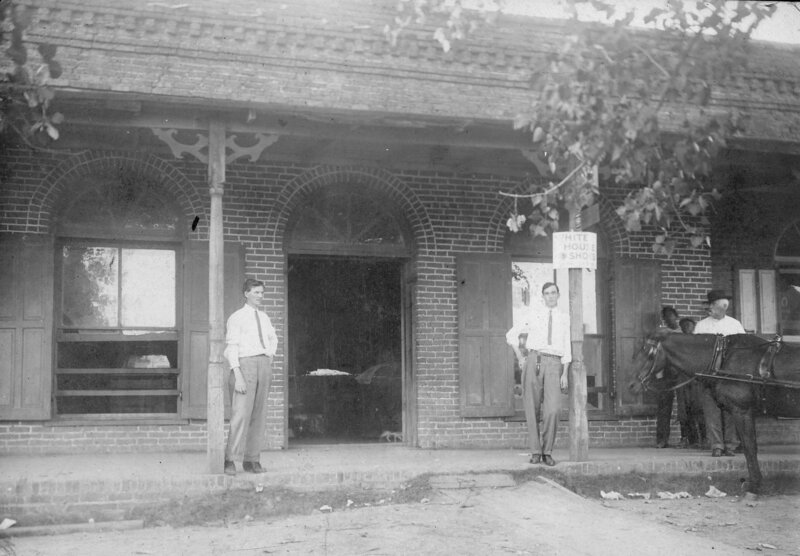 It was burglarized (1921) and burned and Mr. Jack Ervin rebuilt it and operated the bank there for many years. His brother Wade Ervin preceded him in the bank as Cashier and Manager until his death. Mr. Nathaniel Scales Carr was the first bank president until his death and my father, George W. Hairston, succeeded him and remained in that capacity until his death. 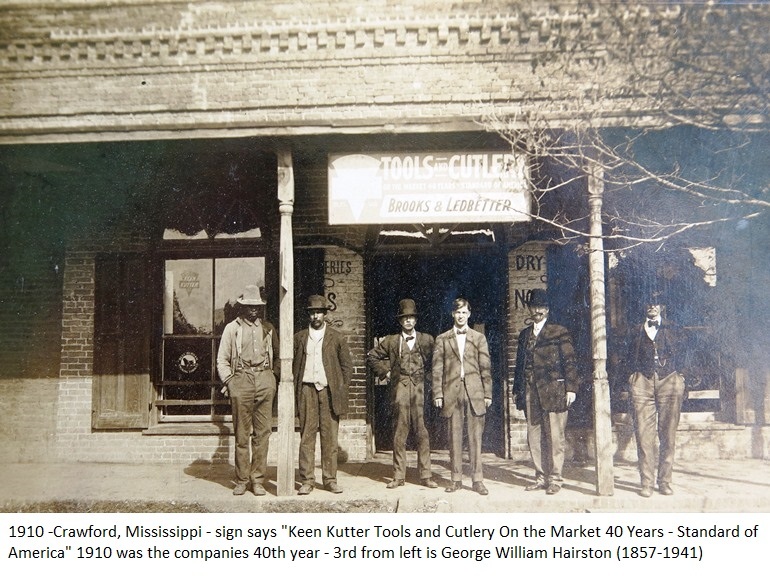 My father, George W. Hairston, owned a general merchandize store and extensive farming. interests and the local cotton gin. After his death we sold the gin to the Potts family who still operate it. 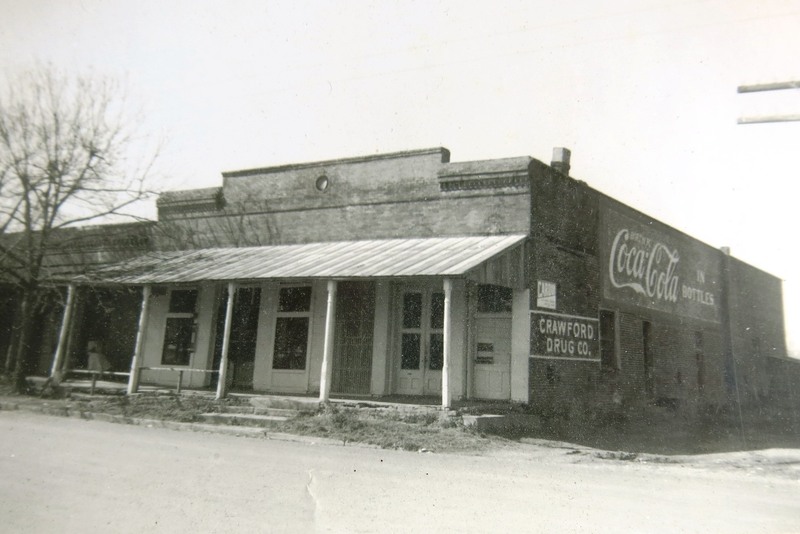 The business district of Crawford was comprised of several general merchandise stores, a drug store, a post office, a barber shop, a black smith shop and when automobiles came into being there were two gasoline stations. There was a railroad station. GM&O passenger trains brought pssengers and U.S. Mail from St. Louis and Mobile and way stations everyday. The railroad had a flourishing freight business especially in the Fall when cotton was being shipped to warehouses. Crawford had a good dentist - Harry Smith. An incorporated post-town and a thriving station on the Mobile Ohio R.R., in the southwestern part of Lowndes County, about 18 miles southwest of Columbus. Brooksville, 6 miles south by rail, is the nearest banking town. The town was named for the Rev. Peter Crawford, a Baptist minister. It has four churches and an academy, and a money-order post office. Population in 1900 was 389. One of the more important villages in Lowndes County. In the black prairie belt a gently undulating, rich region, well timbered and producing crops of cotton, corn, etc. In the long, long ago there was a very large frame building across the street from the store in Crawford. It was built for an armory and used for storage of arms by the National Guard. This building had a large stage at the south end of the building. When it was no longer needed as an armory, it was used as a recreation hall and several times a year dances were held there. All the young people from miles around came. Good dance bands were engaged and really great, good times were enjoyed. I was a small girl then but my mother would take my sister and me out with the neighbor children. We would sit on the side-line and watch, all of which was a real thrill for us. In the later years I can remember that school plays and other functions were held in the old armory. It has been demolished - no trace of it is left except the happy memories that still dwell with me. My Grandfather Dr. Peter Constantine Hairston, was a doctor. He and his family lived about 5 miles in the country east of Crawford. He served as doctor for the entire west end of Lowndes County in which Crawford is located. Mr. Sam Potts and his family were neighbors - their lands were adjoining - they had extensive farming interests. "The Institute" was the only school in Crawford. It was located west and slightly north of the business section of Crawford. It was a very large, rather "barny", building built with the idea of having boarding students as well as the local children. As far as I know, there were never any boarding students but children came from Crawford and a wide area surrounding Crawford. It was a splendid school and many successful men and women of that day, some still living, can remember it with pride. Later, a more modern school was built nearer the center of town, and again it was always a good school with well qualified teachers. Finally when school systems were consolidated, Crawford could not support a school. The children were bussed to other towns and schools. Mrs. Samuel Webb and Mrs. Aupert Richards were sisters - name Davis. Davis Home -- first "Way Station" for U.S. Mail Delivery and transportation. Mail delivered by horse drawn vehicle. Gilmer home -- across street from Ervin home – burned years ago. Harvey home -- occupied by Theophilus Harvey who donated and deeded land for Crawford Cemetery about one mile west of Crawford and west of Harvey home. Subsequently sold to George W. Hairston -- later given to his daughter Laura May Hairston. Later sold to Dr. Thomas W. Frazier who lived there with his second wife and made the house into a nursing home for the elderly. The house has been demolished. The 1st Methodist Parsonage -- now unoccupied. Crawford originally had three churches, Methodist, Baptist, Camelight. The Methodist Church burned twice but the denomination and membership was and is strong and has survived and rebuilt and now is the only Church for White people in Crawford. New Parsonage nearby. 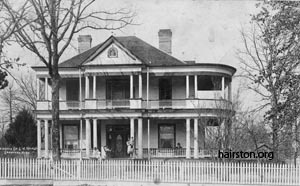 The house in which Mrs. Walton Ledbetter and her daughter live is one of the earlier houses in Crawford. It was built by Captain George Patterson Waller and occupied by him and his first wife and children. Later it was occupied by Mr. Fred Waller, a son, and his wife and children. 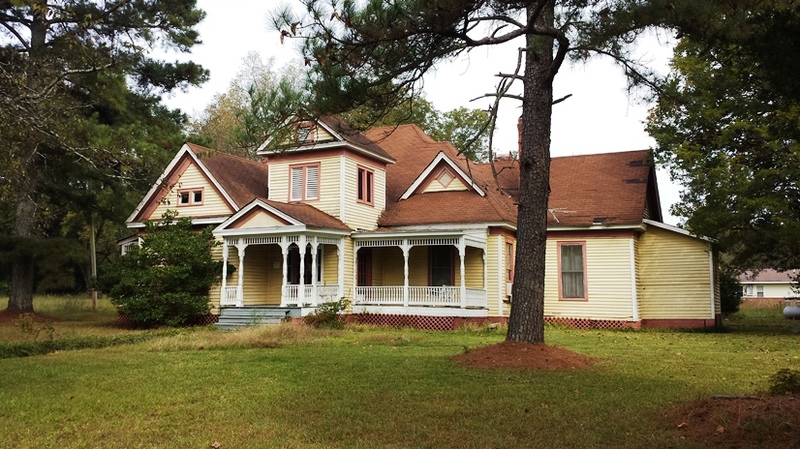 Later sold to and occupied by Captain J. M. (Jack) Ledbetter and his wife and children. Mrs. Walton Ledbetter is the widow of Walton Ledbetter, son of Capt. J. M. Ledbetter. My father, Mr. George W. Hairston and his family owned and occupied a cottage next door to the Wallers. When I was 9 years old (1909) our family had grown considerably, therefore, my father built, on the same lot, a very large and more modern house. He and my mother and their children as well as children from an earlier marriage lived there. After my parents passed away we sold the house and lot. A brick bungalow-type house now replaces the old house. Across the street stands one of the very early house of Crawford. It was built by Mr. Aden Powell and his two unmarried sisters. Mr. Aden Powell was a wheel chair patient. A very fine business man. Owned land north and east of Crawford about 3 miles away. When he died my father looked after the business interests of the two sisters. When they passed away my mother bought the home and it was rental property until it was bought by the present occupants. There were several other houses in early Crawford including my grandmother Tharp’s (Laura N. Ledbetter Tharp), but that burned and the other’s either burned or were taken down. Early Families of Crawford and Lowndes Co.
Brooks (2 families unrelated), Davis, Flournoy, Harvey (2 families unrelated), Ervin , Smith, Archer, Waller, Hairston, Powell, Ledbetter, Tharp, Henkel, Scales, Potts, Turner, Bragg, Cavanah and Moorehead. Note: "August 17, Friday night fire destroyed 12 stores and 6 warehouses, loss of $100,000, insurance $16,000" Memphis Daily Appeal 19 Aug 1883 - "On one side of street were B. V. Halbert and Company, Woodin, Jim Nance, Irvin & Hairston, Randall & Smith, Smith & Reeder, Kier & Carr Brothers, N. Scales and Company and on the oppisite side of street, Ferguson, Brooks & Peace, W. P. Wyatt, Lawrence & Hales, Theophilus Harvey." From The Autobiography of a Little Man. p. 62-63.